Sibling Rivalry on Ice | Kid Reporters' Notebook | Scholastic Inc.
Ice hockey stars Marissa (left) and Hannah Brandt of Vadnais Heights, Minnesota. The sisters represented different countries at the 2018 Winter Olympic Games in South Korea. When you play the same sport as your sibling, there’s bound to be a little healthy competition. Now imagine playing against your sibling at the Olympics! Two sisters from Vadnais Heights, Minnesota, experienced this unique situation at the 2018 Winter Olympic Games in PyeongChang, South Korea. 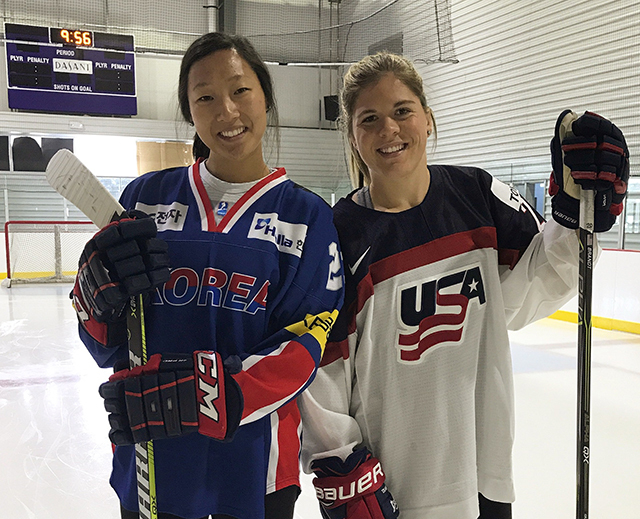 Hannah Brandt, 24, represented the United States women’s hockey team, while her 25-year-old sister, Marissa, played for the Korean team. Marissa was born in South Korea. When she was four months old, Greg and Robin Brandt of the U.S. adopted her. Marissa and the Brandts’ biological daughter, Hannah, both enjoyed ice skating when they were growing up. Initially, Marissa was drawn to figure skating. “I loved it because it was such a graceful sport and something very fun to do,” she told me via email. At age 8, Marissa started playing ice hockey so that she could be with Hannah. “I decided to play hockey purely because my sister played,” Marissa said. Hannah loved having her sister play ice hockey with her. “We got to spend more time together and were able to share similar life experiences,” Hannah said by email. When Marissa and Hannah graduated from high school, they both continued to play hockey, but for different universities. Ironically, they both wore the same number on their jerseys: Number 22. Hannah was a star forward for the University of Minnesota, helping her team win three national titles and becoming an all-time leading scorer at the university. Marissa played for Gustavus Adolphus in St. Peter, Minnesota, where she helped guide her team to three Minnesota Intercollegiate Athletic Conference Championships. Hannah then qualified for the Olympics, along with several of her University of Minnesota teammates. Marissa considered quitting hockey. But she got a surprise call offering her a chance to try out for the Korean ice hockey team. A member of the U.S. women’s ice hockey team battles it out with a player from Finland. The U.S. won the game, setting up their gold-medal victory against Canada. Marissa decided to play under her birth name, Park Yoon-jung. An additional spotlight fell on the South Korean team weeks before the Games, when it was announced that North and South Korea would field a unified women’s hockey team. They ended up finishing in eighth place. Hannah played in five games in PyeongChang and recorded a goal and an assist, helping the U.S. team win gold for the first time since 1998. They defeated the Canadian team in the finals. Members of the U.S. women’s ice hockey team wave to fans at a basketball team. The athletes are wearing the gold medals they won in PyeongChang. The Brandt sisters say that the countless hours they spent on the rink have paid off. “If you work hard enough and want something bad enough, anything is possible,” Hannah said. Marissa agrees. “Being disciplined will get you to that next level,” she said.